It’s weird to be hitting the end of the week, but we’re only on 7 out of our Top 11. Ain’t that just crazy? It’s like seeing an electric zebra! Zebstrika is a Stage 1 Lightning Pokemon, 110 HP, with a Fighting Weakness, a Metal Resistance, and a Retreat Cost of 1. He’s got Head Bolt, a 2-for-60 vanilla strike, and Fast Speed, an Ability which lets you discard your entire hand to draw 4 cards from your deck once per turn. You can probably guess which of those is what landed Zebstrika so high on the list. It’s the Sightseer idea again, except that you only get to draw 4 cards and you have to discard your entire hand. On the other hand, you get to do this and still use your Supporter for the turn, which makes Sightseer a bit superfluous in a deck with Zebstrika – more than is needed, if you will. There you go, SAT word for the day! That kind of draw power is extremely valuable in any case, and it’s no surprise that Zebstrika makes the list for sure. There are certainly advantages and disadvantages between this and Sightseer – Zebstrika can be KO’d for a Prize and takes up 2 slots in your deck, but it doesn’t cost a Supporter and can be triggered multiple times if you’ve got the Bench space for it. So feel free to give this zebra a ride! …figuratively. I mean, don’t literally ride the card. Arora Notealus: Zebstrika doesn’t offer the selectiveness that Sightseer does, opting to just chuck out every card in your hand rather than pick and choose, so keep that in mind while you play around with him. They may have similar effects, but the two play very differently from each other. Not to mention Head Bolt can be a decent attack on its own, especially with Electropower! Weekend Thought: Do you agree with our list so far? Think a card should be higher and another lower, or think that there should be a card on the list that isn’t? Any ideas as to what our #1 spot is going to be? Next Time: Time to go back to the lab to learn something important. If you’re just joining us but know our usual countdown procedure, you might be surprised that we are only on our seventh place selection. For reasons that will eventually become clear (or at least known), we’re counting down our top 11 picks from the latest expansion. We close the week with Zebstrika (SM – Lost Thunder 82/214). As a Stage 1, it won’t be as fast or reliable as a Basic but it does dodge the handful of anti-Basic effects, and Stage 1 Pokémon have still proven quite competitive. The [L] Typing isn’t going to matter much for reasons we’ll get to, though if you do happen to run it alongside other [L] support, run into Weakness in a deck where Zebstrika can attack, etc. it is a nice bonus. 110 HP is still a quite probable OHKO against your typical competitive deck, but it is high enough that it isn’t an easy OHKO for bonus Bench hits and Zebstrika may even be lucky and survive a turn while Active. [F] Weakness means that almost any competitive [F] attacker can score a OHKO; they do tend to stack damage bonuses even on less damaging attacks after all. [M] Resistance is appreciated, but may not matter given that more recent, successful [M] Type attackers aren’t overly prolific AND tend to swing so hard they’ll still overcome 110 HP, Resistance or no. The Retreat Cost of [C] is good normally, and there’s reason enough to slap an Escape Board on Zebstrika to gain a perfect free Retreat Cost, as we’ll see. The attack isn’t too important, so we’ll cover it before the Ability so it doesn’t distract; “Head Bolt” does 60 damage for [LC], a decent return for the Energy involved but a tad awkward in a metagame where Double Colorless Energy is prominent but attaching an extra [L] Energy is not. If the opportunity presents itself, such as in an [L] Type deck or in a Counter Energy packing deck when you’re down on Prizes and something [L] Weak is available to target, it is a good option to have, but most of the time it just won’t matter. What matters so much that it is the main reason to play Zebstrika is its Ability “Sprint”, which has you discard your hand and then draw four cards, with the usual stipulations of only working during your own turn, before you attack, and only being able to be used once per turn per instance of Sprint you have in play. It hasn’t been that long since Professor Sycamore was still Standard-legal, with its effect that discarded your hand then drew seven cards, and Sprint falls far short of that. Fortunately, as a reusable effect, even on a Stage 1 Bench-sitter, this has much potential. Decks where your hand is large usually are due to the accrual of smaller draw effects, sometimes over multiple turns. Frustratingly, my account got hit by the recent bug in the PTCGO which prevents you from using the Deck Builder, so the only place I’ve been “testing” Zebstrika is in the Theme Format, where your hand can easily become rather large. So my “Theorymon” for the Standard and even Expanded Format play, is that a deck with at least some consideration of Zebstrika can keep its hand size modest, probably discarding zero to three cards to draw four… unless it wants to discard more. If you’re not new to the Pokémon TCG, you’ve had to at least notice some cards make excellent use of the discard pile. Some such cards, like Malamar (SM – Forbidden Light 51/131; SM – Black Star Promos SM117), operate in decks I doubt have the Bench space or deck space to spare on Zebstrika. Other decks are so good at thinning out their hand, the aforementioned Oranguru is a better deal. If you’re already running Zoroark-GX, it seems unlikely you’d need to supplement its draw power with another Stage 1, even if Zebstrika is only worth a single Prize compared to a Pokémon-GX’s two. While I’ve described a good chunk of the competitive metagame at this point, maybe even over half of it, less than half can still be awfully big. I’ve mentioned the “Roto Motor” series of Rotom cards, which all have an Ability by that name which allows them to ignore the Energy costs of their attacks if you have at least nine Tools in your discard pile. Zebstrika provides a nice way to discard Tools quickly, so that the deck can begin swinging by a player’s second turn with some reliability but without having to run a Pokémon-GX (like Zoroark-GX). As Zebstrika is only a regular “Rare” card and is found in the new “Storm Caller” Theme Deck, it is slated to become the new “budget” draw Ability, like Octillery (XY – BREAKthrough 33/162) was for Shaymin-EX (XY – Roaring Skies 77/108, 77a/108, 106/108). There is some concern, as discarding your hand doesn’t play all that nice with other Evolutions, especially Stage 2 Pokémon wanting to use Rare Candy. Possibly, they will just have to look elsewhere for additional draw power, possibly players will need to adjust how they build their decks. My attempts at running Feraligatr (Dragon Majesty 24/70) did not go well, but just maybe running Zebstrika instead of Oranguru can work. I mean, the deck tried not to rely too heavily on Rare Candy anyway, as I wished to use the Ability found on Croconaw (Shining Legends 19/73). I bring these up as a possible example; if I run more Rescue Stretcher, just maybe the discard won’t wreck the setting up of the Stage 2 Pokémon. Zebstrika is the new budget, bench-sitting draw option, settling into a niche between Oranguru and Zoroark-GX in the Standard Format. As always, Expanded sees more competition, more counters, but also more combos; I am intrigued by the idea of a “budget”, EX/GX-less Night March or Vespiquen (XY – Ancient Origins 10/98) deck, among others. It also leads to versions of those decks with less to fear from Karen or Oricorio (SM – Guardians Rising 51/145; SM – Black Star Promos SM19). Even though it may wreck your hand, this card is great in the Limited Format and Theme Format. Today, we’re looking at Zebstrika from Lost Thunder. After looking at this card, I can say with certainty that this will see a lot of play. That’s because it has an ability that lets you draw cards. In Zebstrika‘s case, it lets you discard your hand and draw 4 cards. Seems like this ability is half as powerful as Professor Sycamore/Juniper, but it can work every turn. And if you have multiple Zebstrika in play, assuming you have four of them, you can use this ability FOUR times that can make you draw 16 cards in one turn! It is also a great Bench sitter in that regard, being used for the ability alone and racking up damage on certain attacks that determines how many Pokémon in play, like Empoleon ULP and Zoroark-GX for instance. It’s attack isn’t too shabby either, doing 60 damage for LC. And being a Lightning type, it can benefit with an item card called Electropower, which can boost the damage output by 30 during the turn you’ve played this card. This could potentially make Zebstrika form it’s own deck as well! When you factor in stackable uses of Electric Power, plus Choice Band and maybe the Eeveelutions from Ancient Origins, you are capable of achieving OHKOs. It’s own 110 HP with Metal resistance is nice for its staying power. Overall, Zebstrika offers variety of ways to use it, and all I can say is to grab a playset of this Pokemon if you can. Though as of this writing, we are soon getting another Pokémon that has an even better draw power, so enjoy Zebstrika while you still can because it might be eventually replaced. Zebstrika (LOT 82) leaps into the format out of the Lost Thunder expansion set. 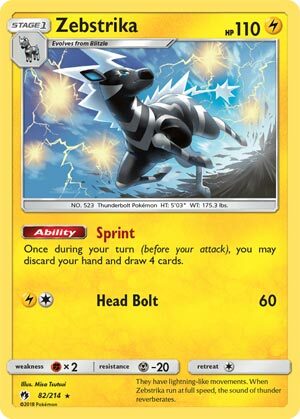 This 110 HP, Stage 1 Lightning type Pokemon has become one of the most anticipated cards in this newest expansion because of its attack Head Bolt that does sixty damage for a Lightning and Colorless energy. OK hopefully that gave you a little bit of a chuckle. We all know why we’re super stoked for the Zebra: put two of them on your bench and you can put eight fresh cards into your hand every turn. But this card isn’t for every deck: there’s no way you can run this in a Stage 2 archetype. I also can’t see it in a deck that relies on multiple bench sitters like Squids or Cofatina. But for decks that are all Basics and have a ton of insta play cards – spread decks, the Rotoms builds that have been running around, and maybe even Lost March – Zebstrika is perfect. I’m even trying to put together a deck that doesn’t have any draw supporters – only ball search cards – so that you’re not reliant on getting a Cynthia or Lillie or Copycat every turn… but I’m still looking for the right card for that. Zebstrika might be even better than Octillery – sometimes Octillery would get you zero or maybe 1 card. This will always put four cards in your hand every turn.